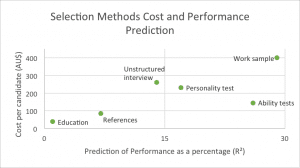 Part One: ROI of Psychometric Testing: Why use it? According to a study by Harvard University, approximately 80% of employee turnover can be attributed to mistakes made during the hiring process. Contrary to popular belief, factors such as education, experience and job knowledge are not the most likely predictors of successful candidates. 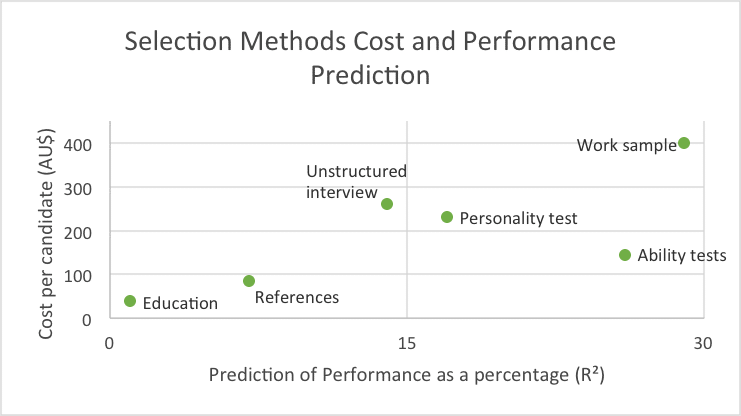 As shown in the diagram below, psychometric tests such as personality and ability tests are the most effective way to predict candidate performance while keeping costs in check. While the above information is compelling in itself, why else would you use psychometric testing? Does it actually result in a Return on Investment (ROI)? Psychometric tests provide accurate measurements of the traits that are directly relevant to the role, providing a fuller picture of the candidate’s ability. These traits are typically more ‘hidden’ and may be hard to capture by other means such as interviews. Technological advancements of online psychometric tests means that they can be administered, scored and reported on in quicker and more efficient ways than ever before. Hundreds of candidates can be sent assessments at the click of a button, and their data can be analysed and compared electronically. With a recent global trend being that there are significantly more applications per job advertisement, psychometric testing makes it easier and quicker for organisations to deal with high application volumes and shortlist the best candidates for the role. While interviews intend to be consistent for all applicants, people are inclined to base their impressions on their emotions and personal preferences. These biases can lead to inaccurate conclusions about the ability of the candidate and hence hiring decisions. Psychometric tests provide a more fair and accurate way of assessing a candidate, as all applicants are given the same test/questions, scored in the same manner, and any weighting and comparison will also be standardised across candidates. Incorrect candidate selection may not only lead to low productivity and counterproductive work behaviours, but may also impact the working morale of those that work in direct contact with this person. Additional costs may be posed to the organisation through accidents, absenteeism and of course staff turnover. Psychometric testing can help reduce these costs by assisting in hiring the right candidate. Psychometric testing can add significant value to your recruitment process. It adds objectivity, reduces individual biases and can save organisations time and money during and after the recruitment process. Part Two of this series will provide you with a formula you can use to determine if psychometric testing will provide your organisation with a ROI. This will help you decide whether this solution is for you and a business case to present to your leaders. Richardson, M. A. (2005). Recruitment Strategies Managing/Effecting the Recruitment Process, USA: Harvard University Graduate School of Business Administration.